Multiple Sclerosis, or MS, is an autoimmune and neurological disease that affects the central nervous system of the body. When your body sends a message to another part of the body, it does so through nerve cells. 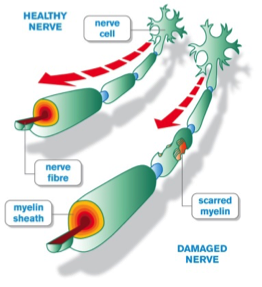 The nerve cells transmit these signals through fibers to ensure that every electrical impulse gets to its intended target. In a healthy nerve, the electrical impulses travel easily from one nerve cell to the other. In someone with MS, there is a disruption. MS causes the body to destroy the coating protects the fibers, leaving them exposed and damaged. Nerve impulses now travelling down these fibers experience distortion or interruptions, often producing a variety of symptoms. MS is like having your electrical wires crossed, you expect one thing, and sometimes get something else. According to a study conducted by the VA in 2012, almost 13% of all veterans are diagnosed with MS. This is a higher rate than the general population and no one really knows exactly why. How can I get VA Compensation for MS? 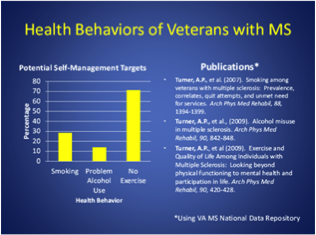 MS is rated at a minimum of 30% based on the VA rating schedule. Symptoms of MS include loss of coordination, weakness, difficulty eating, muscle spasms or tics, difficulty breathing, nerve paralysis, double vision, depression, and other mental disorders. MS is presumptive if it is diagnosed during active duty or to a compensable level within 7 years of discharge from Active Duty service. Applying for VA Compensation within this period is imperative if you have been diagnosed during service or the seven years post discharge. Presumptive means that you do not need a nexus statement, something linking your disability to your service. If you do not file during the presumptive time, you will need a nexus from a doctor and an in-service event or exposure to link the MS to active duty service. What if I am not service connected? Can I still get benefits? Yes, whether service connected or not, the VA also offers other benefits to all veterans who have MS. Veterans who are non-service connected for MS are still eligible for benefits in several ways. First, of course, check to see if you are within the presumptive period and apply for disability compensation, or, if you or your doctor can link symptoms back to that presumptive period, even if you were not yet diagnosed, go ahead and file a claim. You don’t have anything to lose. The VA has Multiple Sclerosis Centers of Excellence to serve these veterans with specifically targeted treatments, benefits, and care. The VA created the Multiple Sclerosis Centers of Excellence to serve these veterans with specifically targeted treatments, benefits, and care. Now, without receiving disability compensation, veterans with MS are may also be eligible for an array of other services. Prosthetic and Sensory Aids: this includes devices such as hearing aids, eyeglasses, speech and communication devices, home dialysis, orthopedic, wheelchairs, respiratory aids, hospital beds, and other daily-living aids. Home Improvement Grants: there are several types of grants veterans can apply for to modify or purchase specially adaptive homes due to severely debilitating diseases such as MS.
other interdisciplinary specialties and evaluation of needs for mobility such as power chairs. Modifications: automobile adaptive grants cover the one time purchase of adaptive equipment for such items as van lifts. Clothing Allowance: Veterans may receive an annual monetary allowance to assist with the purchase of clothing that is damaged due to orthopedic appliances such as wheelchairs, etc. Prescription medications: MS medications are expensive, and sometimes insurance copays are almost as expensive when the medications are Tier three or not covered at all, based on eligibility, VA prescriptions may be able to help with those costs. Mental Health Services: All mental health services are available to eligible veterans, and there is legislation to expand those services to all veterans soon. MS victims have the extra burden of emotional issues due to the neurological damage that MS wreaks on the person’s brain. Respite Care: everyone needs a break now and then, and while we recognize that the person suffering from MS never gets a break, those who care for them need those breaks from time to time to deal with not only the physical demands, but the emotional ones as well. Respite is an often under-utilized service that is available to those eligible for it. The MS Centers for Excellence also provide services for caregivers. Whether they are part time, full time, family members, friends, or paid; they have a responsibility that outweighs every other; the responsibility of another person’s well-being and health. For all caregivers, this is an enormous responsibility and one that often wears them down emotionally over time. However, with those caring for MS patients, it can often be extra difficult due to the emotional issues. People with MS often experience lack of emotional filtering, this is especially true when there is damage or an active lesion to the nerves that are in the brain stem areas. The brain stem is the part of the brain that deals with emotion and instinct. Couple this with any issues in the regulation parts of the brain, and you have someone who says everything they think, good or bad, no matter what the consequences; and it can sometimes be very hurtful if you are a loved one caring for them. Having support for caregivers is a much needed service for those who care for Veterans with MS due to this unique aspect of the disease. The caregiver program, MS Caregivers, provides a toll free hotline, up to 30 days of respite care per year, a support network including the Caregiver REACH program (one specifically designed for those caring for Veterans with MS); and telephone and in person based support groups. There is a huge amount of resources from the VA and the MS Foundation for caregivers to utilize. There are also studies and treatment available. 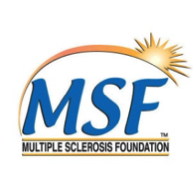 The MS Foundation has a booklet available for free download called Disease Modifying Therapies for MS that is found on the VA’s website and goes through all of the main 13 current treatment modalities so that Veterans can discuss them with their doctors. This brochure covers injectables, orals, and infused medications and reviews pros, cons, and approvals. The MS Centers of Excellence also offer a Smartphone App for Apple iPhone, Android, and Blackberry Torch. The app links Veterans to med information, coverage information on adaptive equipment, caregiver resources, and other VA benefits, symptom management, and VA resources. Instructions for downloading can be found here. The MS Centers of Excellence also works hard at keeping up with the latest therapies, advancements in research, and technology. 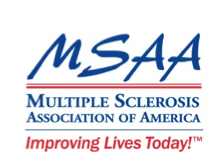 Below are links to their site and some others that are valuable to anyone with Multiple Sclerosis. Posted a question back in February on whether or not to opt into the ramp after my initial claims denial and then being denied again when I filed a reconsideration. I ask would a 3rd bite at the apple with the same raters be smart.Update, opted into the ramp and in May recieved serviced connected award on 2 of 3 conditions.Just wanted to give other Vets some feedback who may be on the fence about opting in. Glad to hear RAMP helped you out! I know someone discharged from the military because of being on antidepressants more than 1 yr. And having MS. No money payout and a 20 %rating was given only for arm paralysis. I think she should be getting a much higher rating and for the MS, not just a symptom of the MS. I work at our local VA as a clinical social worker and provide psychotherapy for her mood. She has relapse remitting type. She can no longer work after being a Master Sgt. Followed by 20 yrs. Of civilian employment. She always looks nice, is pleasant and does not use any assistive devices. I think many believe she is malingering as her psychiatrist is recommending she go to work. He didn't even know she has MS.While it is documented in my notes and her primary MD notes, the psychiatrist missed it. Part of the problem is that she sees a private neurologist. I have encouraged her to also request to see a VA neurologist, not only for better continuity of care, but to establish clear evidence in her VA record to support a claim for a higher rating. She is married with 3 children and at risk of foreclosure on their home as the husband has a low paying job.As a social worker, I try to see the bigger picture. She seems entitled to so much more.And her depression could very well be from the MS as they began in the service around the same time.I have encouraged her to file a claim for the depression. She talks about how frustrating it is when people do not understand the MS, ie, when she cannot keep commitments due to the MS fluctuations.So I am hoping she'll see our neurologist and maybe I'll refer her for neuropsychiatric testing due to some cognitive impairments she's beginning to experience.She lost her claim for SSDI ,and it is on appeal for the depression. Her attorney is not focusing at all on the MS which surprises me, and apparently the attorney did not know what "incontenance" meant.I guess I am writing to Express my own frustrations here about people, particularly professionals who have so little knowledge about MS. Sorry to hear about this case. It is all too common for professionals working in the field to be ill-educated about the system and conditions. You are right that MS should be rated much higher, and if it was first diagnosed while on active duty should qualify as service-connected. The minimum rating for any case of MS is 30%. Luckily, she can submit a claim at any time for a service-connected condition. She probably won't have much success trying to get her DoD rating increased, but she should definitely be covered and treated for all of her conditions by the VA. If she has never applied directly for MS, then she definitely needs to submit a claim. If it did, but they didn't rate it correctly, then I hope she is appealing. 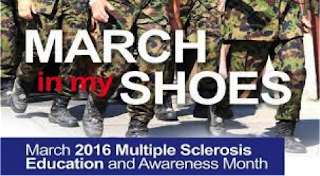 What happens if a Vietnam Veteran exposed to Agent Orange has an off-spring who developed MS? Can she receive benefits? The VA does provide some benefits for children with birth defects, but MS is not considered a birth defect. There are no benefits currently given for children with MS for Agent Orange Exposure.